I'm sick with pneumonia but that won't stop me from doing my nails. I received nail polish from a line called "Tammy Taylor" and I am really impressed. The formula for these polishes is amazing. It's opaque in two coats and dries SO fast. It also has a glossy finish and the top coat "ZCoat" leaves a glossier finish than Seche Vite. 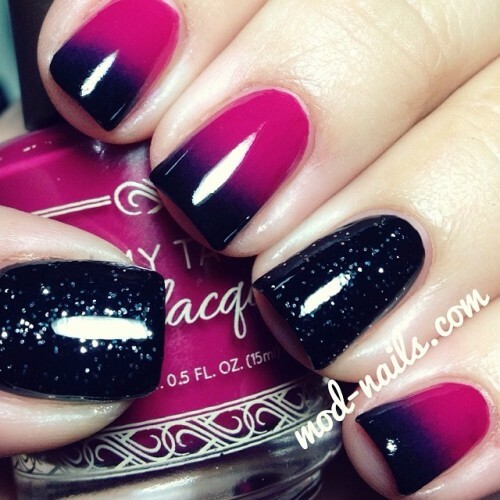 For this gradient looked I used "Genie In A Bottle", a dark pink for the base color. Once it dried I added "Little Black Dress" with a makeup sponge for the gradient effect. I used "Little Black Dress" on my thumb and ring finger topped with "Dazzle Me Up." Once it was dry I topped it with "Z Coat." Grab these and other beautiful polishes at Tammy Taylor!